UPDATE: Please consider the comments below before purchasing from Sarah Seven. I have not had personal experience with her dresses, but almost a year after writing this post, I am still getting negative feedback. She also took down her etsy shop, which removed an easy way to find reviews. My sister sent me a link to Sara Seven's etsy shop (UPDATE: her shop is now closed) yesterday and we drooled over the gorgeous fabrics and frothy layers of sustainable fabrics. The photography alone will grab your attention. Then Daily Candy sent me news that she had just launched her own online dress shop and I felt compelled to share it with you, just in case you missed it. Oh, and she donates part of the proceeds to charity. Warm fuzzies! Some bridal, some just fabulous, but all right up my alley. I adore her style! By the way, i absolutely LOVE what you did to your place!!! You should be an interior designer...or are you? Did you hire someone to decorate? It's SO lovely! Oh lala the robins egg is beautiful! TS- Thank you! I decorated it myself :) It was so much fun. Wow these are gorgeous! I love that you can have dresses custom made- so special! These dresses are so gorgeous! Check out her etsy feedback and read about how she ruined people's wedding dresses through poor sewing before you drool over these dresses. I like robin's egg blue as much as the next gal, I just like my seams straight and the stitching done properly. Amen sister. Survivor of a ruined dress right here. If you are going to post a negative review...how about owning your comments with your name. She hasn't had a tearful bride yet..I work with Sarah and the haters are everywhere in life and yes we deal with them too! No need for anyone to dig for negative reviews, Google caches them from the whole world to see. Even after you delete your etsy account. Easy as pie, search for sarah seven etsy negative feedback, it's the second link, click on the word cached. I will state my name, provide photos and emails full of bs excuses for anyone with doubt. My name is Brittany DeCarolis and I ordered from Sarah. She barely ruined my wedding day cause a dress is a dress, but she sent me a poorly made Peaceful Afternoon dress weeks and weeks late. 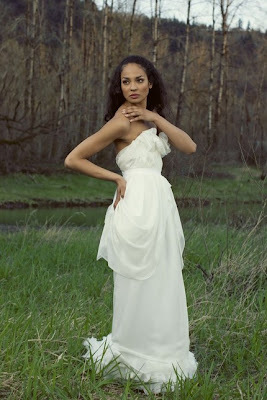 I had to reach out to women at stylemepretty.com, a site Sara advertises with, to actually get my dress in the end. It didn't fit, was cheaply made and not presentable - a wasted $515. Shame on me for not paying attention to all the negative feedback on Etsy at the time of my purchase. i just received a dress from sarah seven. I got the peaceful afternoon dress also. I have to admit the stitching was a little off, and really did look diff from the photo.I wouldn't say it ruined it. luckily it looked very cute one me,but if i could do it all again. (wedding 3 weeks away, just got it today.) i would not buy a dress from her. I literally had to threaten her with her life it seemed to get a simple hello. My wedding is very laid back and no matter what ill make the dress work, but please if your looking for your dream dress DO NOT get one from her. I do like (not love) my dress but it not worth the stress. I have ordered many dresses from Sarah Seven and had many friends order dresses from her and they have all been wonderful. This girl deserves some serious credit as to the work she does and the style she has come up with. It is truly unique and beautiful. I would highly suggest her to any bride and will continue to do so. Hi can any of you give me advice as to how to get a refund...I think Sarah is screwing me too! I have been waiting 2 weeks to hear from her after she gave me the expected ship date for 2 weeks ago. I ordered one of the in stock dresses that says on her site that it ships in 2.5 weeks. It's now been more than a month! Please help or give me some advice! Contact the Better Business Bureau. If you google sarahseven and better business bureau you can view her complaint page. There is a tab you can click to file a complaint. Looks like she resolved the complaints so that should do the trick for ya! My fiance ordered a dress from Sarah Seven about 4 months ago. She had to pay up front. Up until payment was made, Sarah had great communication. As soon as payment was sent, Sarah stopped all responses. The dress was promised to be delivered about 7 weeks before our wedding. At the 7 week point, no dress had been received. We are now 9 days from the wedding - still no dress. My fiance has sent 20+ emails to Sarah. Sarah has responded 3 times - each time saying the dress was in the mail and she would get us a tracking number (tomorrow). The first of those emails was 5 weeks ago. At this point, Sarah has taken the joy out of the process of getting a wedding dress. I can see she has done this to countless other people. It is unfortunate that someone with good talent is such a poor business person. We are now in the process of pursuing legal action to get our money back. AVOID her and her products at all costs. PS. To the writers above who say you have worked with Sarah and talk about how wonderful she is - shame on you. You can obviously see the numerous customers that have had unexplainable issues with Sarah Seven. If you work with you, you are part of the problem as well. We ordered and paid in full for a dress in September 2011. We have not received it. There are so, so many negative reviews online about Sarah Seven's exceptionally poor customer service that we were very nervous about ordering from her. We sent her a message asking for a phone number so we could speak to her directly about the order. She replied quickly and we phoned her. That is the ONLY email she has replied promptly to and the ONLY phone call she has answered. Sarah sounded very sweet on the phone so we felt reassured and placed the order. She told us that she was currently making up several of the dress we wanted so would put our name on one and we could expect it by mid to late November 2011. The only communication we have had from Sarah was the week before Christmas when she emailed that she had no idea that we had not received the dress and would look into it. The dismal lack of communication is beyond frustrating. We can not imagine any legitimate business that operates with standards like she has displayed for us. We sincerely hope anyone considering dealing with her will think twice and instead choose to give their business to someone with honourable business practices. It will save them a lot of hassle and negative energy. Like all of the reviews on here, I saw my Sarah Seven dress online and couldn't find anything like it in Australia. So I knew I would have to buy my wedding dress online, sight unseen. So the first thing I checked were the reviews and they were HORRIBLE! So after a minor freak out I made the plan to make sure none of the things that people had complained about would happen to me. There were complaints about workmanship - so I asked a friend in LA whom I trusted with a knowledge of handmade wares so have a look for me. She also got to speak to Sarah who told her about different fabric options. There were complaints about timelines - so I gave it plenty of time. There were complaints about bad fit - so I gave my measurements. There were complaints about communication - so I ordered through an Australian store who had never had a problem with her garments arriving. The dress arrived. EARLY! AND PERFECT. The fit is perfect. The colour is perfect. The workmanship is exactly what I would expect from a handmade garment and its perfect. I love it and I'm so happy I took the risk. Mary S.